After a computer-simulated boxing match declares Rocky Balboa victorious over current champion Mason "The Line" Dixon, the long-retired fighter agrees to the ultimate underdog challenge: a real-life rematch against Dixon! Now Rocky must push himself to the breaking point to go the distance one last time. Special Features Commentary By Sylvester Stallone, Deleted Scenes, Alternate Ending, Boxing Bloopers, Rocky Balboa: Going The Distanc.. Experience the stirring and triumphant Rocky like never before with this Definitive Edition that boasts the film's best-ever picture quality along with state-of-the-art DVD audio, exploiting the entire range of DVD sound! In addition, revealing Special Features will give unparalleled access behind the scenes, making this Definitive Edition the ultimate in home entertainment excitement! In 1976, moviegoer's packed cinemas to cheer an unk..
Go the distance with this Rocky Heavyweight Collection featuring all six knockout Rocky films on Blu-Ray plus six exclusive character cards with collectible artwork. Sylvester Stallone stars in the greatest boxing saga of all time and triumphs as one of the most inspirational characters in cinematic history. Witness every epic, action-packed fight and unforgettable moment as Rocky strives for greatness through sheer determination agains..
Go the distance with this Rocky Heavyweight Collection, featuring all six knockout Rocky films. Sylvester Stallone stars in the greatest boxing saga of all time and triumphs as one of the most inspirational characters in cinematic history. Witness every epic, action-packed fight and unforgettable moment as Rocky strives for greatness through sheer determination against impossible odds. 6-Disc set Includes; Rocky: Newly remastered with ..
Own Rocky - The Complete Saga (6 Films) DVD from Deff, DVD, Blu-Ray & 4K Video Specialists - Free UK Delivery..
Own Rocky / Rocky II DVD from Deff, DVD, Blu-Ray & 4K Video Specialists - Free UK Delivery..
30 years after the clang of the first bell, Rocky Balboa dons his gloves for his final fight... Armed with a highly credible, heart-wrenching story, Sylvester Stallone leaps back in to the ring in this knockout final chapter as one of the most iconic characters in the history of motion pictures! Since retiring, Rocky reminisces about his glory days for the locals at his Philly diner, Adrians. But his quiet worlds is shattered when the c.. Nominated for 10 Academy Awards, this 1976 Best Picture Winner inspired a nation! A struggling Philadelphia club fighter (Sylvester Stallone) gets a once-in-a-lifetime opportunity to fight for love, glory and self-respect. Featuring a legendary musical score and thrilling fight sequences, this rousing crowd-pleaser scores a knockout! Special Features '8mm Home Movies Of Rocky' (1975) - Narrated By Director John G Avildsen And Productio..
Own Rocky DVD from Deff, DVD, Blu-Ray & 4K Video Specialists - Free UK Delivery.. It's the rematch of the century as Rocky Balboa takes on Apollo Creed in this powerful follow-up to one of the most acclaimed movies in film history. Writer-director-star Sylvester Stallone succeeds in creating a powerful feel-good movie hailed as "a stunning effort in every way" (New York Post). 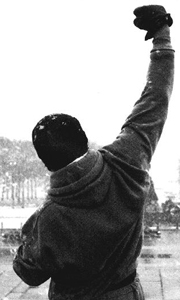 After club fighter Rocky Balboa (Stallone) goes the distance with the world heavyweight champion, boxing fans clamor for a rematch. But Rocky,..
Rocky battles his most powerful adversary yet - the ferocious Clubber Lang (Mr.T) - in this hard-hitting actioner that comes out swinging with adventure, humour and emotionally charged human drama. For what may be the most exciting and fast-paced film in the series, Sylvester Stallone writes, directs and stars with explosive passion and intensity. As Rocky Balboa (Stallone) fights his way into the hearts of millions, life couldn't be be..
Own Rocky IV DVD from Deff, DVD, Blu-Ray & 4K Video Specialists - Free UK Delivery..